I wasn’t ready to be depressed tonight. 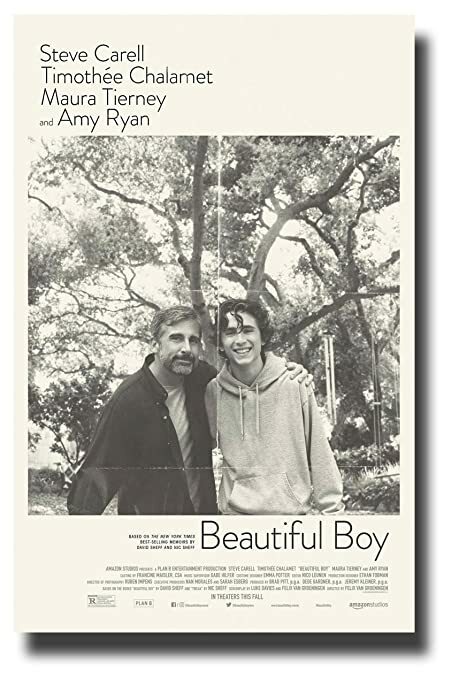 Beautiful Boy is a teen drug movie starring Timothée Chalamet and Steve Carell and the pair of them are amazing here. Unfortunately, much of the movie itself was average at best and felt, at times, manipulative. However, there is absolutely no denying that Timothée Chalamet nailed this. He was superb as Nic, the young boy who finds himself addicted to drugs and unable to maintain his sobriety. As good as Chalamet was, I think Steve Carell matched with with every scene. Carell provided such a remarkably subtle performance filled with nuances that made me believe that Carell was truly David, the father of this boy that, no matter what he did, he just could not help. The rest of the cast is very good as well, with a special shout out to Maura Tierney as David’s second wife and step-mother to Nic. Still, the story meanders around and, at times, feels more self-important than it needed to feel. It felt a few times that my emotions were being manipulated and they were not just seriously reacting to the situations happening on the screen. This is base don a true story, based on both the book written by David Sheff and the book written by Nic Sheff. Still, the reason to see this is for the masterful performance from these two actors. Timothée Chalamet is amazing considering how young of an actor he is. Steve Carell has improved with every outing and he matches his young co-star with every glance. The performances make this much more compelling than it had a right to be.